The response across the nation to my pre-announcement of my candidacy for the U.S. Senate has been even more greatly underwhelming than anticipated. Apparently, the Senate has plenty of white males already. It might be advisable to emphasize diversity within my gene pool. One of my grandfathers used to say that he was “mixed as the dogs in the streets.” With fewer dogs in the streets due to leash laws, as well as the greater use of spay and neuter clinics, that saying probably lost some of its impact. Shucks, that was gonna bring me some street cred. I do have two grandparents born to Swedish immigrants, so I could emphasize a strong Viking heritage. The new TV series called The Vikings might have helped in popularizing Vikings, yet I am not certain that will translate into electability. I need more of an American identity. Colorado is a western state. We elected a former Senator named Ben Nighthorse Campbell. I like Senator Campbell and even met him at a cafe when he was on his way to a meeting and asked me for directions after I introduced myself. Former University of Colorado Professor Ward Churchill did not run for office as far as I know, but he knew how to get attention. Professor Churchill not only offended lots of folks by his comments about 911 being the fault of Americans rather than terrorists, but he also turned out to be a poser about being Native American. I might have more Indian blood than him. My gramma, who lived in Chickasha, Oklahoma, claimed to be part-Indian before it was so popular that Professor Churchill wanted to join the Native American club. I don’t think Gramma knew about the scholarships or she might have gone further than the eighth grade. On the subject of Native American vs. Indian, isn’t it telling that the American Indian Movement (AIM) organization named itself what it did? 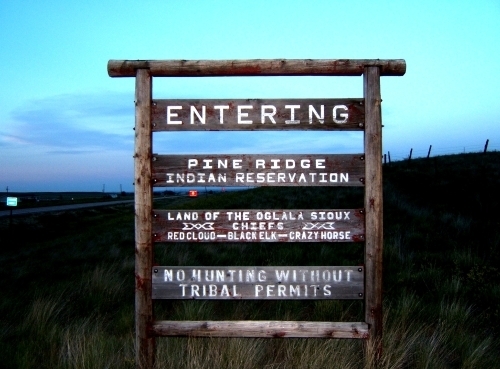 Also, the proud Oglala Sioux at the Pine Ridge Indian Reservation have not changed their sign. Will Rogers is one of my heroes. I wish he was still around to be my campaign chairman. Back to the drawing board………. I am working on “branding” my campaign identity. How does the electorate feel about cowboys? As I do this strategic planning, based on Will Rogers and Gramma, I have decided to open up my campaign staff to Okies, despite my Texan wife’s prejudices. Yesterday I wrote about our trip to the Black Hills of South Dakota last weekend. Actually, that post was more about our misadventures with the trailer we rented. This one will be more positive and well illustrated with American Bison, also known as Buffaloes, so if you are not enthused about such critters, back off immediately. Buffaloes were central to the culture of Plains Indians, including the Lakota Sioux people, many of whom still live in South Dakota. I have previously written about the Pine Ridge Reservation. Tomorrow, I intend to write about a famous Lakota leader, Crazy Horse. 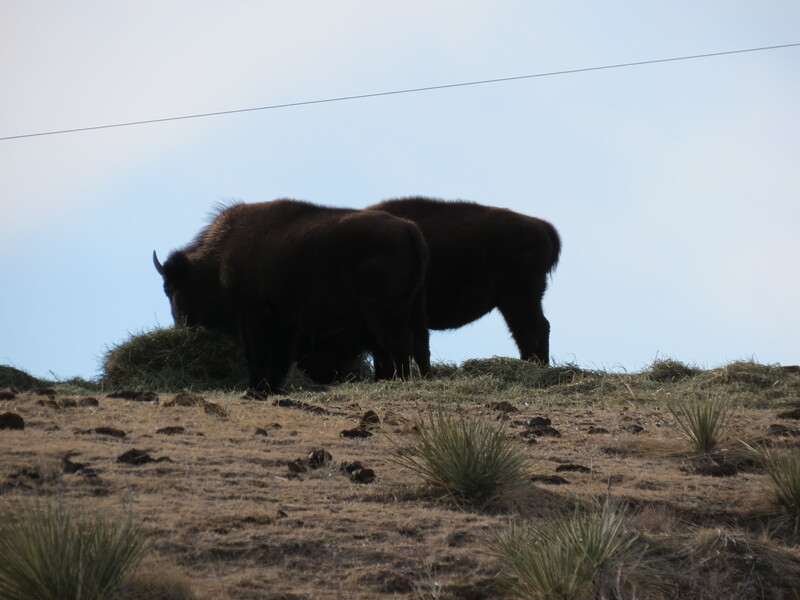 There is a large buffalo herd in Custer State Park. Yesterday was the annual buffalo round-up there. During the weekend prior to that event, when we were visiting, the town of Custer celebrated the importance of buffalo to the area in many ways. On street corners throughout downtown Custer were life-size model buffaloes that had been painted creatively by artists. On Friday evening was a reception at a bank at which the public could meet the artists and get a preview of their artwork, which was auctioned off the next day. 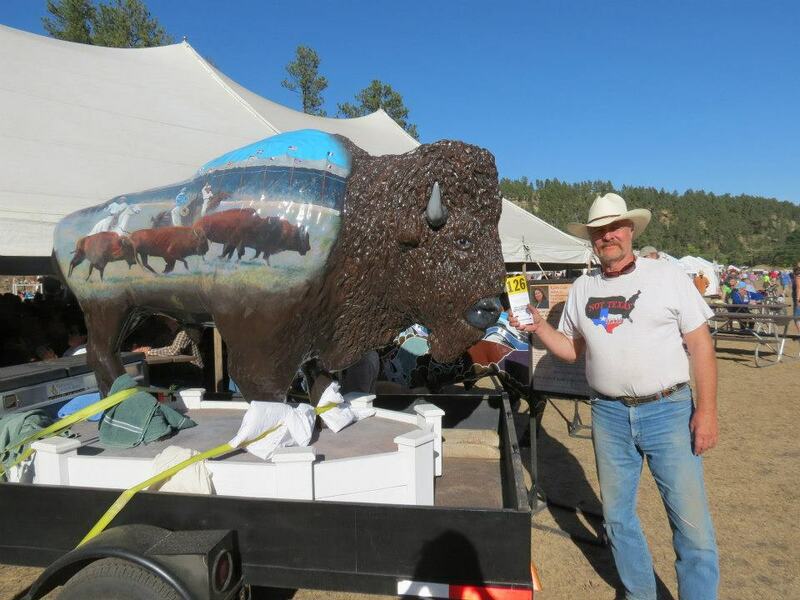 Not only were the full sized buffaloes auctioned, but also smaller sculptures of buffaloes and paintings of buffaloes. Lots of buffalo art! Since our home is decorated with western art, and since Miss Sugar is an artist and art teacher, the art auction was of great interest to us. I’d like to say that we picked this weekend so that we could attend, but it was simply good luck that we happened to be there. Now you are probably wondering what art we purchased. The answer is that the bidders were out of our league. However, we did buy a buffalo skull from a booth of such items. 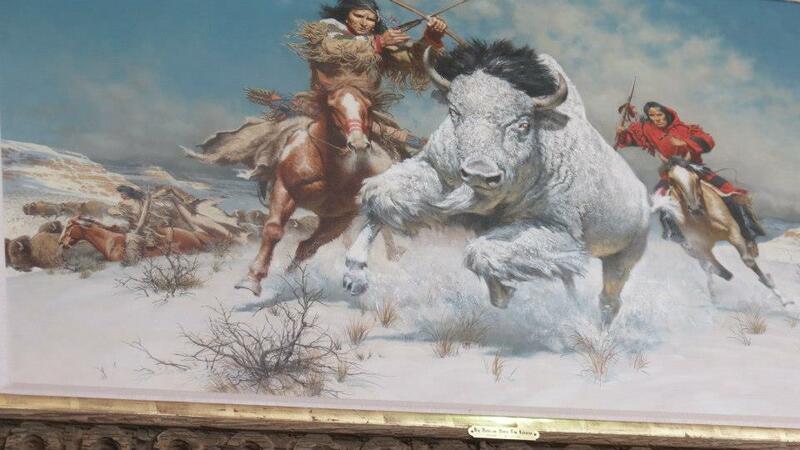 It was not part of the auction but it was part of the buffalo festival. 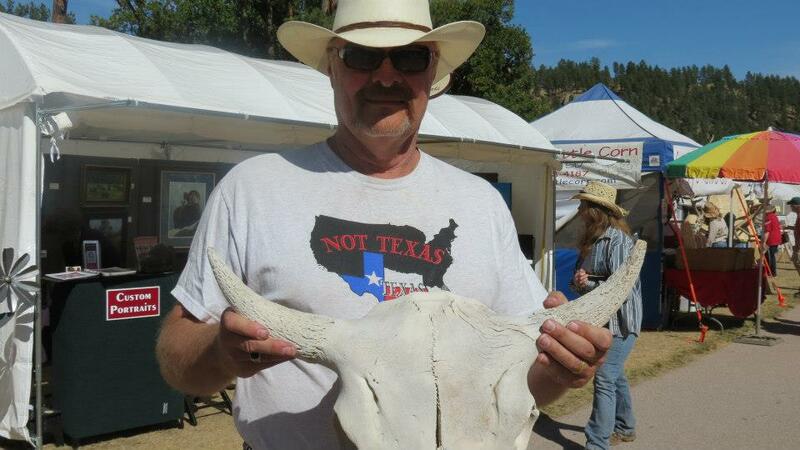 We’d like to go back to Custer, South Dakota next September for the buffalo weekend. My Grampa Carlson was a rural mailcarrier in Burt County, Nebraska. His route included part of a reservation shared by the Omaha and Winnebago tribes. Macy, Nebraska is a town on the reservation. I had fun when Grampa took me to the Macy PowWow. The dancing and music was supposed to be the draw. For me, however, I played with other little boys I met under the bleachers. They were not old enough to be part of the show, I guess, but they were friendly Indians and invited me to play in the woods, away from the event. There we had our own powwow, called making friends. I was envious of their situation because I came from a much more under-privileged background. The particular privilege of which I was deprived was that my mother did not allow me to throw knives. Can you believe that? As a cowboy nearing kindergarten age, I deeply resented my mother’s unreasonable interference with my chosen lifestyle, which obviously required practicing skills with weapons. So, in the woods, I was delighted that my new friends shared their knives with me and we took turns throwing them into trees. What happens in the woods, stays in the woods. What Mom did not know did not hurt her.